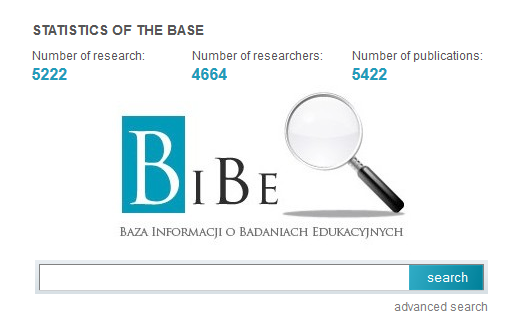 The search engine of the Educational Research Information Base (in Polish: Baza Informacji o Badaniach Edukacyjnych) - is a tool that facilitates the search for educational research in a fast and easy way. 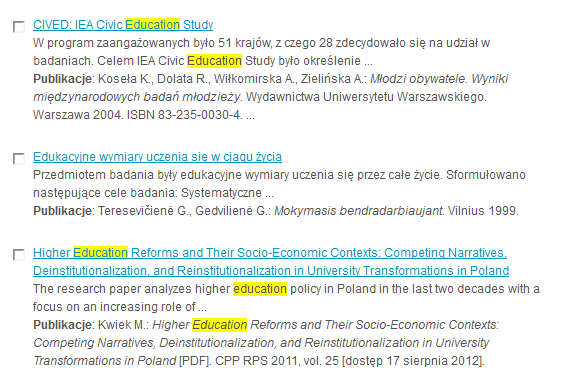 It provides instant information on significant reports of educational research conducted in Poland, covering the years 1989 to 2015. BIBE search options include: basic search, advanced search and indexed, which is part of the advanced search. The options of the basic and advanced search are based on the inflectional dictionary, owing to which the search results include all inflection forms of searched word. Additionally, on the right side of the search engine there is a concise set of tags (tag cloud) which in a fast way allows find research reports on a particular curriculum subject or level of education. Clicking on a particular word automatically transfers to the page with search results. Below the tag cloud there is a window Recent searches where User’s entries and number of research found in BIBE are shown. 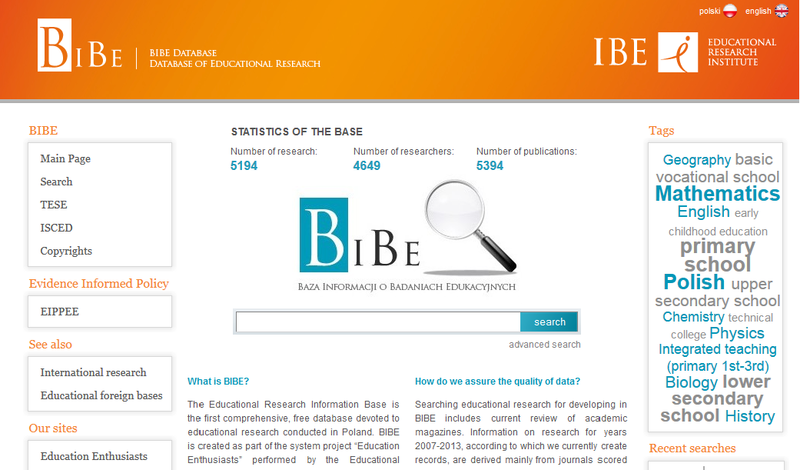 The basic search is available on the BIBE main page. You can also find the option in the advanced search. The link to the basic search is in the right bottom corner, below the search boxes. To search the database in the basic search, you need to write any entry, then click on the search button or press the enter key. The search skips single letters, prepositions and conjunctions. After writing the entry ‘duration of compulsory education’, the search engine will read it as ‘duration compulsory education’ (while maintaining inflection forms of given words). In order to find the searched phrase unchanged, you need to put it in quotation marks, e.g. : “duration of compulsory education”. The results are presented as a list of research. Each result on the displayed list is at the same time an abridged record and consists of the title of the research, an excerpt of abstract and bibliographical data of the research report. The searched entry is highlighted in yellow. Next to each result on the list, on the left side, there is an empty window – when marked, it is bookmarked as the list of “Watched research”, shown to the right side. When clicked in the title (in the result list or on the bookmark), a window with full description of the chosen research will open. Thanks to the advanced search it is possible even more accurate browsing BIBE through different options and entries. In order to go to the advanced search you need to select the option “Search engine” from the left panel of the website or to click on the link in the right bottom corner below the window of the basic search on the main page. The search engine filter is divided into two parts. The first part of the filter (i.e. search options in the white background) applies to description of research (record), while the second part (i.e. options in orange box) applies to sources of research reports. Abstract – by choosing this criterion, we search through a word across the entire abstracts. By putting given phrase in quotation marks, we will have exactly the same phrase in search results. Phrase – it is possible to search through any word or phrase included in all description parts of the research. To find records including a specific phrase in unchanged form, you need to use quotation marks. Institution – searching through a word included in the name of the institution or through a specific name of the institution. 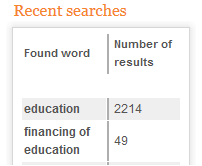 ISCED – this criterion allows you to browse all of the research concerning particular education levels. The International Standard Classification of Education (ISCED) updated version of 2011 consists of nine levels from 0 to 8. Level 0 - early childhood education; 1 – primary education (in Poland grades I-III; IV-VI); 2 – lower secondary education; 3 – upper secondary education (secondary schools: general, technical and vocational); 4 – post-secondary non-tertiary; 5 – tertiary education: short-cycle; 6 –tertiary education: bachelor level or equivalent; 7 – tertiary education: master level or equivalent; 8 – doctoral level or equivalent. 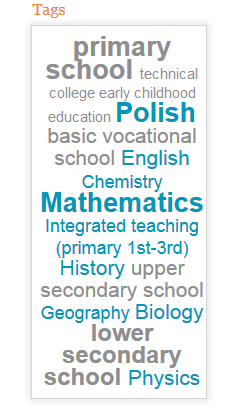 School subject – browsing the database in terms of research on particular of 31 curriculum subjects, regardless of the educational level. Keywords - derived from the authors of the publications; search by Index or by writing a chosen word/phrase. TESE descriptors – browsing the database through entries covered by the Thesaurus for Education Systems in Europe, which is an essential tool for indexing the databases. Title of the research – searching through a word/phrase in the research titles. Publication – includes bibliography of all sources; searching through a word/phrase occurring in the bibliographic description Index . Author of the publication – searching through the author’s surname (the author of the publication is not always the same person as the person carrying out a research). Book - searching through a word/phrase occurring in book title Index. Chapter – searching through a word/phrase occurring in titles of chapters (by Index). 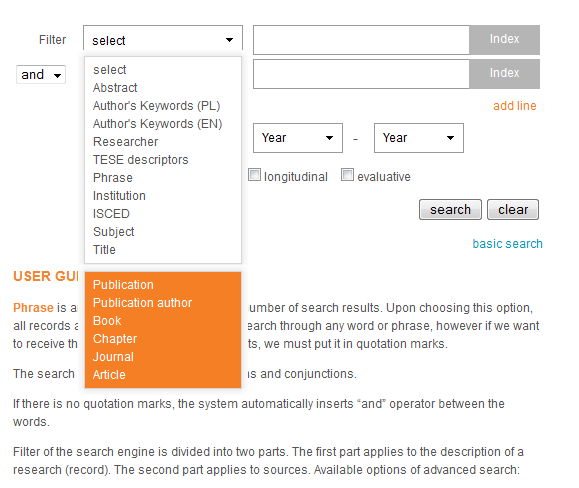 Title of the journal – searching only through journal title Index. Article – searching through a word/phrase occurring in bibliography of articles derived from scientific journals (by Index). In the advanced search it is possible to specify the date (generally the period: 1989 – 2015). Select the years from the pull-down menu. You can also mark a type of the research (four choices: international, cyclical, longitudinal, evaluative). With writing a term or a phrase in the most options (also in Phrase option) the instant results are being displayed; among them you can choose the searched term or you can finish writing them individually. The search engine skips single letters and conjunctions. After writing the entry achievements in school, the search engine will read the phrase as ‘achievements school’ (including inflective forms of both words). In results obtained, to find the searched phrase unchanged, you need to quote it. In advanced search engine there is an option of combining particular filters with the aid of coordinating conjunction “and”, alternative “or” and particle “no” – an appropriate conjunction must be chosen from the scroll bar with selection of filters in the left side window. Then, the search results will be accurately narrowed to selected records. Indexed search allows you to insert a specific entry from the list located next to filter window in the advanced search. The Indexes are available for the following options of searching: Researcher; Institution; ISCED; School subject; Keywords; TESE descriptors; Title of the research; Publication; Author of the publication; Book; Title of the journal; Article. When you select the appropriate option, corresponding Index is highlighted in the orange background. In order to find the searched term quickly in an open Index, you can use the mini search engine in the left upper corner. 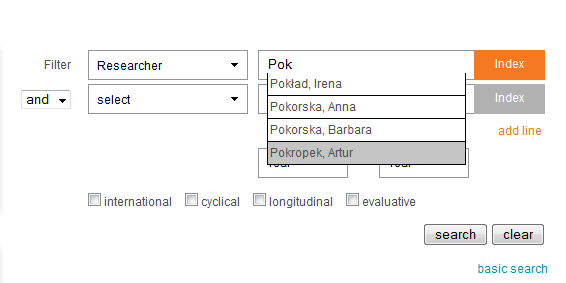 After selecting, for example, the option Researcher and clicking on Index, a new window will open with the index of the surnames of all researchers included in BIBE. After clicking on selected last name, the card with the index will be closed automatically, and the name of the researcher will appear in the window on the right side next to the criterion Researcher. At the same time other search results will be displayed. After writing the entry, a list of results will open, which includes abbreviated descriptions of research. Each shortened record includes title of the research, an excerpt of an abstract and bibliographic data of the publication. The searched entries are highlighted in yellow colour. Above the list, there is displayed a total number of found research and number of pages, on which the list of research was displayed. In order to see the details of the research, you need to click on the Title of the research. There will open a new card with full description containing: abstract, bibliography, keywords, date of the research and other available information for a given research. Above the “card” of the record there are available passages to the next or previous research on the results list and a window Watch – when marked, the research goes to the e-shelf of watched research reports under the tag cloud. Research project (optional) – name of the project, according to which the research was carried out and a link to other research as part of the project. Type of the research (optional) – cyclical, evaluative, international, longitudinal. Institution (optional) – of the institution which carried out the research; after clicking on the name, it is possible to move to other research carried out by given institution; next to it, there is also available a link to the home page of a given institution as an icon of home. Date (applies to carrying out of the research) - depending on the available data, it can be a year of the research, month or specific day; the date in square brackets means estimated date of the research. Researcher (first and last names of the researchers) – after clicking on the last name, it is possible to move to other researches carried out by a given person; last names of directors of the research projects are bolded. Abstract – includes assumptions and hypotheses, the sample, applied research methods, main conclusions from the research. Keywords (derived from the authors of all publications) as well as TESE descriptors (both in Polish and English) assigned to the research. After clicking on the chosen term, it is possible to go to other research reports, to which a given term was assigned. Publications – bibliography to the research, consisting of the research report, which at the same time is the source publication for the prepared abstract; the publication can be in a form of a book, chapters in books, articles or reports available online; in the case of full texts available online, under the bibliography there is an icon of a house; after clicking on the icon you go to the Internet website including given content. This function gives a possibility of creating a list of all watched research reports, regardless of written entries. The list is available while searching of the research and browsing the database. After finishing searching and browsing BIBE, you can print or save the list in HTML format with full descriptions of watched research. In order to add a research to the watched list, you only need to mark the window beside the title of the research with search results. Then, on the right side a box Watched Research will appear. You can successively complete the list of watched research, according to the results of each successive research until you finish browsing BIBE. After clicking on a research title, a new window with full description will open. All you need to do is click on the orange cross to remove the research from the list of watched research. In order to print or send the list on e-mail address, you need to click on the appropriate icon located under the titles of watched researches. After choosing some option, a new window will open with the list of research and functions to print and send the file in the HTML format on e-mail address. So as to save the file with your watched list, you only need to click in the appropriate downloading icon in the window of watched research and select the option Save file.